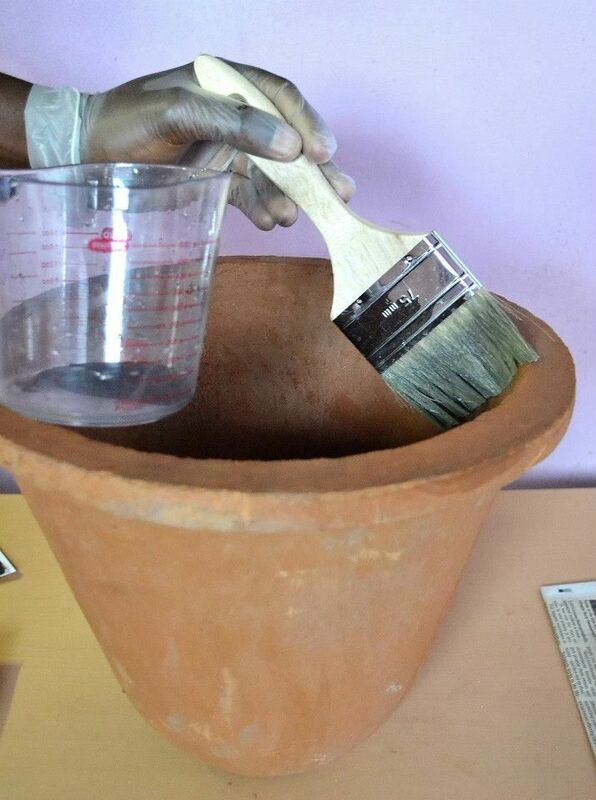 PureMadi uses a simple, yet effective method to manufacture ceramic water filters. Our methods use low-cost local materials (clay, water, sawdust) that are readily available and a manufacturing process that can be performed with local labor. This empowers local communities and helps to minimize filter production costs and pricing. The technological innovations used in our filter-making process were developed by many people from many organizations over the past 15-20 years. Lantagne (2001) provides an early history of the technology development and provides some of the first data on filter performance. In particular, she notes the work of members of the non-profit organization Potter for Peace. This group developed many of the context-appropriate manufacturing procedures that are used in our facility. Little new information was presented over the following few years, until Oyanedel-Craver and Smith (2008) presented laboratory data on the removal of E. coli bacteria by silver-ceramic filtration media. They demonstrated that if properly manufactured, the filters were highly effective with respect to pathogen removal. Even without silver addition, the ceramic media was effective in removing E. coli, but the silver further improved the filter performance. Our team went on to demonstrate the technological effectiveness of the filter in the community of San Mateo Ixtatan, Guatemala (Kallman et al. 2011). We also demonstrated that the technology produced positive human health benefits for an HIV-positive cohort in rural South Africa (Abebe et al. 2014). Many other scientific studies have contributed to our understanding of ceramic filter technology. An excellent reference to these studies, as well as extensive details on the manufacturing process, can be found in the report prepared by the Ceramics Manufacturing Working Group (2010). This report is available HERE for download. PureMadi has received extensive support through the Jefferson Public Citizens Program at the University of Virginia. A number of publications in this organizations journal, Public, describe the creation of our first filter factory and subsequent field testing of filter performance (Tyeryar et al. 2011, 2012; Hackett et al. 2013, Nguyen et al., 2014). Clay from a local deposit is collected and air-dried. Rocks are removed from the clay by hand. the clay is then grinder into a fine powder using a hammer mill. The processed clay is then stored in bags until ready for use in filter production. • Sawdust is delivered from a local sawmill. Like the clay, this raw material is free and we only pay a modest delivery charge. The sawdust is passed through a 16-mesh screen incorporated into a sieve table. The sieved sawdust is then stored in bags until ready for use in filter production. • The processed clay and sawdust is mixed together in roughly a 1:1 ratio (volume basis). The precise ratio is based on the properties of the clay and thereby varies from factory to factory. Water is also mixed in, and a mechanical mixer assures that the mixture is homogeneous. • The clay-water-sawdust mixture is pressed into the shape of a pot using a filter press. The press does not require electricity, and pressure is applied using a conventional truck jack. • The pressed filters are smoothed to improve their aesthetic appearance and allowed to air dry for several days. The air drying helps to prevent cracking of the filters during the subsequent firing step. • The air-dried filters are placed in a wood-fired or electric kiln and fired at a final temperature of 870 ˚C. During firing, the clay particles harden into ceramic and the sawdust combusts, leaving behind pore space that will permit slow water percolation through the filter. • After cooling and removal from the kiln, the filters are subjected to two tests to insure their quality. First, they are subjected to a pressure test wherein the exterior surface of each filter is submerged in water. The filter is deemed to pass this test if no water permeates into the inner surface of this filter after 10 seconds. This test insures there are no cracks in the filter. For the second test, the flow rate of each fully water-saturated filter is measured. Flow rates must fall between 1.5 and 3 liters per hour to pass this test. If filter flow rates are less than 1.5 liters per hour, users will likely be dissatisfied with filter performance and will not use them. If the flow rate is greater than 3.0 liters per hour, there is concern that a crack might be present, which might result in unsatisfactory filter performance with respect to turbidity and pathogen removal. If a filter fails either of the above two tests, they are destroyed. • Filters that pass both tests are allowed to air dry. Each filter is then painted with a colloidal silver solution. This is an aqueous suspension of silver nanoparticles. When the solution is applied to the filter surfaces with a paint brush, the suspension is drawn into the filter by capillary action. The silver nanoparticles lodge in the filter pore space. Silver is a highly effective disinfectant for waterborne pathogens. • Following silver application, the filters are again air dried and packaged for distribution. Each filter is sold with a 20-liter plastic receptacle with a spigot and cover. The filter is placed into the receptacle, and water is poured into the filter. The water gradually percolates through the filter, and turbidity and waterborne pathogens are removed by the combined effects to physical filtration and silver disinfection. Abebe, L. S., J. A. Smith, S. Narkiewicz, V. Oyanedel-Craver, M. Conaway, A. Singo, A. Samie, P. Mojapelo, J. Brant and R. Dillingham (2014). "Ceramic water filters impregnated with silver nanoparticles as a point-of-use water-treatment intervention for HIV-positive individuals in Limpopo Province, South Africa: A pilot study of technological performance and human health benefits." Journal of Water and Health 12(2): 288-300. Hackett, C., T. Hackett, D. Harsh and S. Schrider (2013). "Assessing the establishment of a ceramic water filter factory in Limpopo Province, South Africa." Public: 9-12. Kallman, E., V. Oyanedel-Craver and J. A. Smith (2011). "Ceramic filters impregnated with silver nanoparticles for point-of-use water treatment in rural Guatemala." Journal of Environmental Engineering 137(6): 407-415. Lantagne, D. S. (2001). "Investigation of the Potters for Peace colloidal silver impregnated ceramic filter." Jubilee House Community: 1-79. Oyanedel-Craver, V. and J. A. Smith (2008). "Sustainable colloidal-silver-impregnated ceramic filter for point-of-use water treatment." Environmental Science and Technology 42(3): 927-933. The Ceramics Manufacturing Working Group (2010). Best Practice Recommendations for Local Manufacturing of Ceramic Filters for Water Treatment, Ed. 1. Seattle, WA, USA. Tyeryar, M., J. Reed, C. Hackett, M. Gilmore, L. Abebe and A. Singo (2011). "A study of the feasibility of creating a ceramic water filter factory in Limpopo Province, South Africa." Public 1: 119-127. Tyeryar, M., C. Hackett, D. Harsh and T. Hackett (2012). "Establishing a ceramic water filter factory in Limpopo Province, South Africa." Public: 104-110.